Make Low-Sugar or Sugar-Free Layered Pumpkin Cheesecake with your favorite sweetener and a little sweetener, or use all sweetener and skip the sugar; your choice! Click here to PIN this Sugar-Free or Low-Sugar Layered Pumpkin Cheesecake! Low-Sugar (or Sugar-Free) Layered Pumpkin Cheesecake! If I had to pick one recipe that symbolizes Thanksgiving, for me it would be this Low-Sugar (or Sugar-Free) Layered Pumpkin Cheesecake that I first made for Thanksgiving 2006. This pumpkin cheesecake is a perfect Thanksgiving dessert for anyone who’s watching their sugar intake. I do have to be honest and say that the cheesecake with a small amount of regular sugar has the best flavor, but even the sugar-free version is really good! I originally posted this as two separate recipes, but when I decided to make the cheesecake in a Springform Pan and re-shoot the photos I decided to combine the posts and let you make the choice of which version you’d like. You can make this delicious cheesecake with all sweetener, or add a small amount of sugar for a low-sugar version. 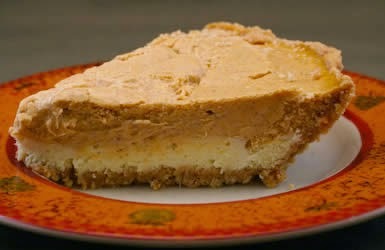 You can also make this in a purchased graham-cracker crust (which does add more sugar.) Or if you don’t care about dieting or limiting sugar, you could definitely make the recipe with all sugar and it would still be a pretty low-sugar dessert. And either way you make it, this will be delicious! I tested the recipe with both a 9-inch Springform Pan and a 7-inch Springform Pan, and both worked fine (although I prefer the thicker cheesecake with the smaller pan.) I used a low-fat Greek yogurt and cream cheese combination. Beat the cream cheese with the vanilla and the sweetener(s) you’re using. Then add the eggs one at a time and beat until combined. Bake the cheesecake in a preheated 325F/170C oven for 35-45 minutes. (It will be a shorter time for the thinner cheesecake, but I cooked it the whole 45 minutes for the thicker one.) Cheesecake is done when the center seems set. Let cool, then chill for several hours or overnight. And the bottom two photos above show my two versions with the thinner cheesecake made in a 9 inch Springform Pan and the thicker one made in the 7-inch Springform Pan. Needless to say, both tasted great! This is definitely one of my favorite low-sugar Thanksgiving treats! You can make Low-Sugar or Sugar-Free Layered Pumpkin Cheesecake with your favorite sweetener and a little sweetener, or use all sweetener and skip the sugar; your choice! I like this best made in a Springform Pan to eliminate the need for a crust. Use a 9-inch Springform Pan for a thinner cheesecake or a 7-inch Springform Pan for a thicker one. In large bowl combine softened cream cheese, sweetener of your choice, sugar (or another 1/4 cup sweetener for sugar-free version) and vanilla. Beat with electric mixer until smooth. Remove one cup of batter and spread into bottom of Springform Pan. Add pumpkin, cinnamon, and pumpkin or apple pie spice to remaining batter and stir until blended. Carefully spread pumpkin layer over first layer in the crust. Allow the cheesecake to cool; then chill several hours or overnight. Cut into eight pieces and serve with whipped cream if desired. This will keep for a few days in the fridge, but you probably won’t have any leftovers. I usually use Stevia in the Raw Granulated Sweetener or Swerve Sweetener for the sweetener for this cheesecake. This recipe originally from AllRecipes with adaptations by Kalyn. Even without the added sugar, pumpkin has carbs, so this Low-Sugar or Sugar-Free Layered Pumpkin Cheesecake would probably never be considered a low-carb or South Beach Diet recipe for the strictest form of those eating plans. And obviously if you’re actively dieting or trying not to gain weight, the sugar-free version of this recipe is best. Glad you like it. Desserts are definitely not my specialty but I’m working on a few right now. Do you cool it in the pan? Yes, you chill it in the pan. I cover with cling-wrap while it chills. I haven't made it with sugar. Hello! I am a gastric bypass patient and cant have alot of sugar with out feeling yucky. I am excited to try to use this recipe. I also do not care for artificial sweeteners at all. I was wondering if you have omitted the artificial sweeteners and just used sugar? If so how did it taste? I want to make this for Thanksgiving but dont have time to make one and try it out before hand. Thanks!! Thanks Catherine. We have definitely enjoyed it. This cheesecake really tastes good! Hi Kalyn – I'm GF/Sugar-Free and interested in trying this out. Do you think using liquid Stevia would off the measurements of sugar? Also, can I use a Pyrex pie dish with a crust instead of spring form? If so, what do you recommend time/temp? I've never cooked with liquid Stevia, but I am doubtful you can substitute it here without making the cheesecake too runny. You could definitely use granulated Stevia though. Should be no problem making it in a pyrex pie dish; I don't think the cooking time will be much different, just keep an eye on it the last few minutes. Rachel, so glad you enjoyed it! great idea to use stevia! Dina, glad you like it. I think the version with Stevia + sugar has the best flavor (of course!) but I've made it with all Stevia as well. I want to make this now and freeze for Thanksgiving, any advice? I haven't frozen it so I can't really guarantee how it will work. I know cheesecake is often frozen though, so I'd assume it will work. I know you can keep it in the fridge for several days. Thanks so much for the reply 🙂 I have been reading up on freezing, I will go ahead and give it a try. Finally making one tomorrow! Ok, that's it, I'm making pumpkin cheesecake this weekend! I have been dreaming (seriously, I did 🙂 ) about making one with those triple ginger snaps from Trader Joes as the crust…now I have the perfect recipe to go with! What is the carb count of this recipe, can't find it? I don't count carbs, but there's a link after the recipe for Calorie Count where you can enter the recipe and it will calculate it for you. I make a similar low fat pumpkin cheesecake for Thanksgiving but I think I'll be switching it up and trying yours! Love the layering. What electric mixer brand do you have or recommend? Very nice, Kalyn. Our family tends to have dessert with less sugar. This is exactly what we want. Thanks Christine; hope you enjoy it. Luana, so glad you liked it. Now I'm wondering why I never tried this with sweet potato; must try that sometime. Kalyn, this was really great. I made a crust with almond flour to keep the carbs down. I made it with sweet potato instead of pumpkin. I bought the yellow sweet potatoes by mistake, so it didn't have the visual impact that the orange ones would have, but the flavor was spot-on. Thanks! Lisa, thanks for that nice review of this recipe. So glad you enjoyed it and hope the blog will be helpful when you're baking for your sister. Hi, Kalyn! Just found your site while looking for desserts to make lower on the glycemic index. I am avid baker and my sister and I (we live together) are both diabetics. She has been on me about making so many desserts-but that is how I relax! I made this layered cheesecake last nite….and we LOVED it! Thank you so much! I am often on the anti-Splenda band wagon, but do have some and used it in this and it was delicious! Thanks also for the review on Stevia in the Raw. I have been using Truvia and such for awhile, but sometimes taste the bitterness. I will definitely be trying Stevia in the Raw! Great site! Can't wait to try more recipes! Thanks Kara, so happy to hear that. And I agree, I'd eat this cheesecake any time of year! Your blog has single handedly made it possible for me to be successful on the South Beach diet, and I want to THANK YOU for taking the time to post amazing recipes. Since it's Valentine's Day, I decided to make the pumpkin cheesecake even though it's traditionally more of a Fall treat. We think it's AH-MA-ZING!!! Terri, it really is 1/2 cup pumpkin, mixed with half the cheesecake batter. Did you forget to divide the cheesecake batter? That’s the only thing I can think of. I don’t know if you’ll see this comment since this is an old post, but I made this and it is super delicious. However, I must have done something wrong because my pumpkin layer was not very thick and did not cover the cream cheese layer. It doesn’t seem as though 1/2 cup of pumpkin is enough. Did I read that wrong? Any advice? I tried this tonight for one of the desserts and loved it! Thanks for the great recipe. So I made this again this weekend for some of my wife’s family who were over to watch a football game. They loved it and I put Cool Whip Free on it. Delicious. If anyone hasn’t tried this they’re missing a really yummy dessert. Only problem is it’s addictive. Have to be careful or I could eat the whole pie. Sometimes I feel such the odd man out since I love pie but so many times the crust is just better left off. Somehow pumpkin cheesecake is such a natural. This is lovely. In any case, your recipe sounded like it fit the bill, so made it last night to try tonight, a test run, so to speak. Well, both my Mom and Dad thought it was great, I was more along the lines of “this is one of the best things I have ever eaten”! Thanks so much for your blog, I look forward daily to reading, in fact, seem to spend a good portion of my time online reading the blogs I subscribe to then adding recipes to my virtual recipe box.As bad as I used to be what with saving all those torn from magazines in numerous manila file folders, filling all those hanging files to bursting. I am sure you can relate. Anonymous, thanks for the tip. We do have a Wild Oats right by my house so I’ll go there today. I didn’t think of looking there. (Salt Lake is getting a Whole Foods store soon – I’m very excited! If you have a Wild Oats or a Whole foods nearby, ask them to order whole wheat phyllo! I think it’s from Fillo Factory. I’m kind of surprised that no one has noticed that the carb count on the AllRecipes post is higher than what I listed for the full sugar version. Just in case someone does notice, I added up the carb counts on the packages of the ingredients I used and then divided by eight for eight servings. Remeber I skipped the whipped topping which does have carbs. I think various brands of things like canned pumpkin can be different, and I always choose the one with the least carbs when I’m shopping. I’m confident that my numbers are correct for the brands I used. I used Libby canned pumpkin if anyone is interested.